There's very little difference between MasterCard and Visa when it comes to interest rates, fees and interest-free days as the bank (or whoever provided the card) sets these terms; MasterCard or Visa simply process the payments you make. But if you use your card on overseas purchases, either online or in stores when outside of New Zealand, what you will pay in NZD will vary depending on whether you use MasterCard or Visa. This is because, as per our extensive research, Visa offers worse FX rates than MasterCard in every currency we analysed. This means that in almost all instances, your purchase will be more expensive if you use a Visa rather than a MasterCard on an overseas transaction. Bank currency conversion fees (1.85% to 2.60% on the transaction value) apply to the purchase as well, so to get the best deal you will need to select a bank that charges the lowest percentage fee. This guide sets out the single significant difference between MasterCard and Visa, and why picking a MasterCard will most likely save you money if you spend overseas. We believe that the best credit card for general spending, including overseas transactions, is a MasterCard. Go overseas and use your credit or debit card and you'll pay a foreign currency commission on top of the exchange rate on the day of your transaction. Banks charge different amounts for their transaction commissions, ranging from 1.85% to 2.60%. The purpose of this guide is to demonstrate the difference in the foreign exchange (FX) rates used by MasterCard and Visa. You may think the card providers would have the same foreign exchange rate; our in-depth research between them proves otherwise. We analysed a range of currencies throughout 2017 and 2018 to determine the best credit card to use for overseas purchases (i.e. online shopping) or to use overseas. Our research was based on each bank's FX commission fee and MasterCard and Visa's average daily exchange rates. We found the best credit cards (specifically Kiwibank's MasterCard range and the FlightCentre Q MasterCard) could save cardholders as much as 3.50% on the purchase value when compared to ANZ, TSB, Westpac and Heartland bank's credit card selection. The 3.50% is a combination of the average MasterCard exchange rate saving (1% compared to Visa) and the currency conversion charge (0% to 2.60%) the bank charges. A 1% difference between MasterCard and Visa does not sound like much, but get the wrong card and you could easily pay $100, $200 or even $300+ more in fees and commissions unnecessarily if you spend NZ$10,000 a year on your credit card on overseas purchases. What does MasterCard having better FX rates than Visa Mean in Practice? What’s the difference between MasterCard and Visa? Other than the names, there really isn't a difference between either credit card provider. Both are accepted equally within New Zealand and all over the world. What you pay in fees, interest and repayment terms will vary between cards but this is based on the bank or lender you use (i.e. Westpac, QCard, Kiwibank etc). Unlike American Express, which tends to be less accepted locally and globally, MasterCard and Visa charge retailers a lower commission and for this reason will be accepted as payment by any retailer who accepts credit cards. 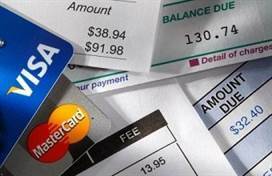 How do Visa and MasterCard make money when I use my credit card? By charging a commission to the retailer each time a purchase is made, historically around 1.50%. This means if you make a $100 purchase, the retailer will pay $1.50 to either Visa or MasterCard depending on your card. ​By charging overseas withdrawal fees which can be as high as NZ$10 if you need to advance money outside of New Zealand. By making a margin on overseas spending by selling you foreign currency at a rate higher than the market price. The actual market exchange rate and the Visa and MasterCard exchange rates are very different. We outline this in detail below. Know this: Interest charged for late payments is collected by your bank or credit card issuer (i.e. GEM Visa or Q MasterCard), not Visa or MasterCard. We were aware from overseas publications that MasterCard's FX rates tended to beat Visa when it came to spending money overseas. But we didn't know if this was the case for popular currencies such as the USD and AUD, or all currencies. To find out, we took the published wholesale exchange rates between October 2017 and October 2018 from the MasterCard and Visa websites. We picked four dates a month and used a range of currencies New Zealanders use when they go overseas. The data we gathered provided us with enough information to compare. The result was striking - MasterCard outperformed Visa in every currency. How much better is the MasterCard rate than the Visa rate? The charts below are proof that MasterCard gives better rates than Visa for every currency we analysed, but the difference does range and overall between all the currencies we looked at, it was around 1.17%. To make sense of our results, we've analysed differences between the Visa and MasterCard FX rates. 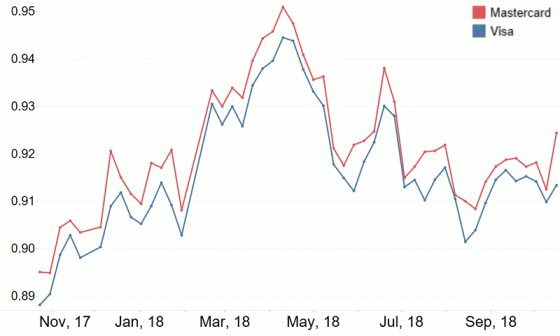 For the Australian Dollar (AUD), as the graph indicates, the MasterCard exchange rate (shown in red) was on average 0.55% better than the Visa exchange rate (shown in blue), which is the smallest average difference of all the currencies we surveyed. This means you would be around $5.50 better off (i.e. pay less) with a MasterCard than a Visa on the same NZ$1,000 purchase in Australian Dollars. 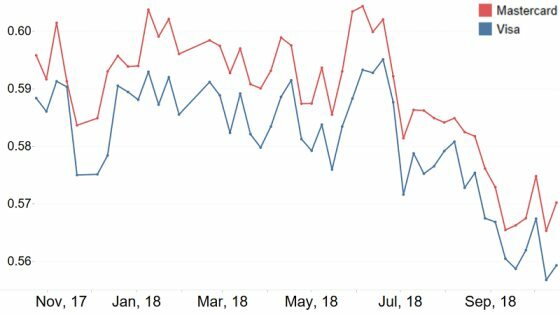 For the British Pounds (GBP), as the graph indicates, the MasterCard exchange rate (shown in red) was on average 1.50% better than the Visa exchange rate (shown in blue). This means you would be around $15 better off (i.e. pay less) with a MasterCard than a Visa on the same NZ$1,000 purchase in British Pounds. 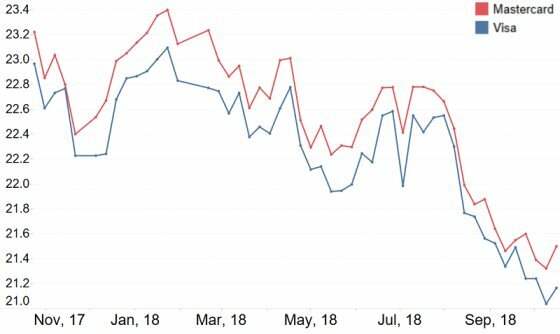 For the US Dollar (USD), as the graph indicates, the MasterCard exchange rate (shown in red) was on average 0.77% better than the Visa exchange rate (shown in blue). This means you would be around $7.70 better off (i.e. pay less) with a MasterCard than a Visa on the same NZ$1,000 purchase in US Dollars. 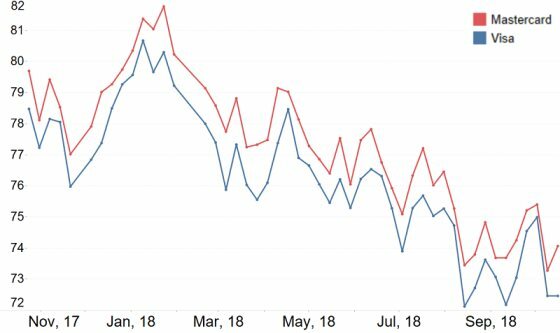 For the Euro (EUR), as the graph indicates, the MasterCard exchange rate (shown in red) was on average 1.42% better than the Visa exchange rate (shown in blue). This means you would be around $14.20 better off (i.e. pay less) with a MasterCard than a Visa on the same NZ$1,000 purchase in Euros. 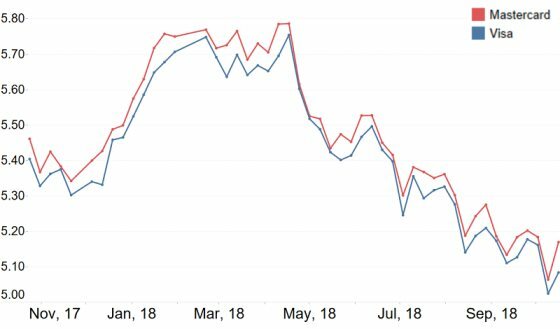 For the Japanese Yen (JPY), as the graph indicates, the MasterCard exchange rate (shown in red) was on average 1.42% better than the Visa exchange rate (shown in blue). This means you would be around $14.20 better off (i.e. pay less) with a MasterCard than a Visa on the same NZ$1,000 purchase in Japanese Yen. 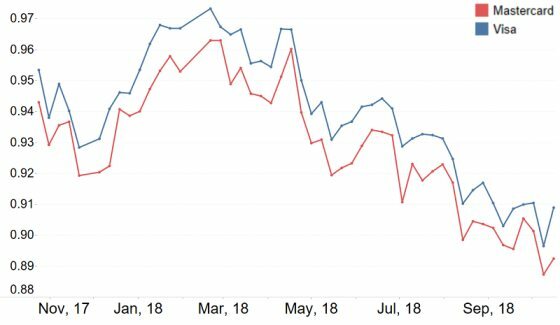 For the Thai Baht (THB), as the graph indicates, the MasterCard exchange rate (shown in red) was on average 1.17% better than the Visa exchange rate (shown in blue). This means you would be around $11.17 better off (i.e. pay less) with a MasterCard than a Visa on the same NZ$1,000 purchase in Thai Baht. 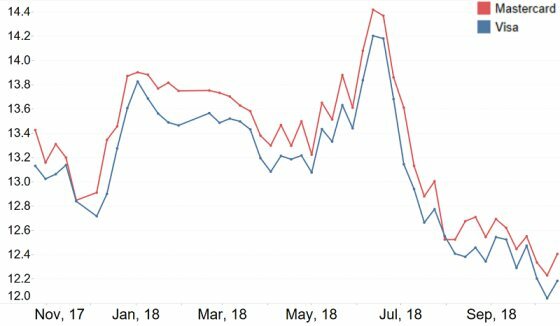 For the Hong Kong Dollar (HKD), as the graph indicates, the MasterCard exchange rate (shown in red) was on average 0.82% better than the Visa exchange rate (shown in blue). This means you would be around $8.20 better off (i.e. pay less) with a MasterCard than a Visa on the same NZ$1,000 purchase in Hong Kong Dollars. 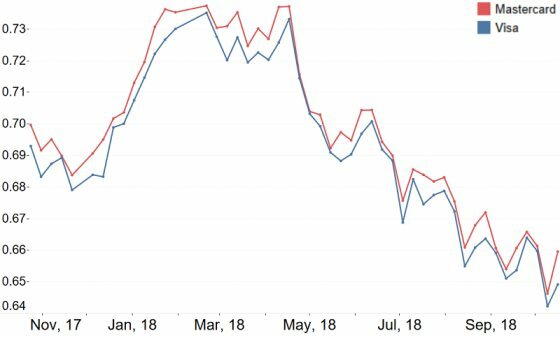 For the Singaporean Dollar (SGD), as the graph indicates, the MasterCard exchange rate (shown in red) was on average 1.17% better than the Visa exchange rate (shown in blue). This means you would be around $11.70 better off (i.e. pay less) ​with a MasterCard than a Visa on the same NZ$1,000 purchase in Singaporean Dollars. 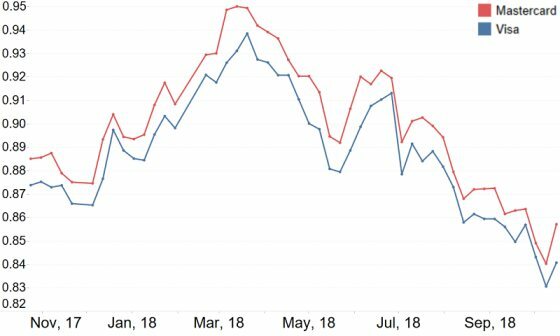 For the Canadian Dollar (CAD), as the graph indicates, the MasterCard exchange rate (shown in red) was on average 1.34% better than the Visa exchange rate (shown in blue). This means you would be around $13.40 better off (i.e. pay less) ​with a MasterCard than a Visa on the same NZ$1,000 purchase in Canadian Dollars. The Mexican Peso (MXP) is the most volatile of the ten currencies we analysed over the course of the 12 months. 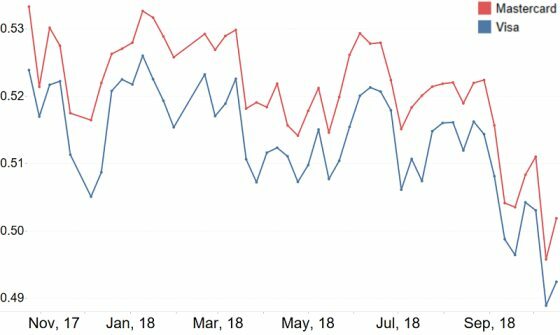 As the graph indicates, the MasterCard exchange rate (shown in red) was on average 1.50% better than the Visa exchange rate (shown in blue). This means you would be around $15 better off (i.e. pay less) ​with a MasterCard than a Visa on the same NZ$1,000 purchase in Mexican Pesos. For every currency, the results are fairly close. The axis on the graphs is enlarged to show the MasterCard advantage, which is the winner in all of the ten currencies we looked at. On average, from all of the currencies we analysed, Visa's exchange rates were worse by an average of around 1.5% for the British Pound 1.40% for the Euro and around 0.50% for both the Australian and American dollars. We sampled a further six Asia-Pacific currencies, outlined in Table 2 below, with all reporting worse rates using Visa compared to MasterCard. While we haven't checked FX rates every day and more than the ten currencies selected, we believe it is very likely that the data we obtained shows a pattern that would apply to the majority (if not all) of the FX rates offered by MasterCard and Visa. These findings are consistent with the 2017 reporting published by MSE UK. In practice, the differences between MasterCard and Visa are small – you wouldn't notice the difference when spending $10 or $50 overseas. But the differences add up, and for single large purchases, a MasterCard is likely to offer a better rate when it comes to charging the foreign currency to a credit card. Our research confirmed that New Zealanders charging British Pounds and Euros to a Visa card paid around 1.5% and 1.42% more respectively when compared to MasterCard. Charges to Australian Dollars and US Dollars had less of a difference, at around 0.55% and 0.77% respectively. For a purchase made overseas that costs the equivalent of NZ$1,000, Visa cardholders will pay an average of $5.50 to $15 more than a MasterCard cardholder based on evidence of lower exchange rates. This additional cost is before bank conversion fees are charged. Again, our research confirmed that New Zealanders charging a number of Asian and Pacific currencies to a Visa card paid around 0.82% and 1.5% more respectively when compared to MasterCard. For a purchase made overseas that costs the equivalent of NZ$1,000, Visa cardholders will pay an average of $8.20 to $15 more than a MasterCard cardholder based on evidence of lower exchange rates. Quite simply, MasterCard will give you a better exchange rate for purchases made overseas than Visa. But, your bank also applies a fee for 'currency conversion assessment' on top of the MasterCard or Visa rate. This can range from 0% (Flight Centre Q Card), 1.85% (Kiwibank credit cards) to 2.50% (ANZ, TSB and Westpac credit cards and debit cards). Our findings state the differences between MasterCard and Visa FX rates for ten popular currencies commonly used for online shopping and/or overseas travel. The average 1.17% difference between the two credit card providers will only amount to around ~$12 per NZ$1,000 spent overseas, but per currency it can vary far more. As an example, using a Visa instead of a MasterCard and spending EUR 2,000 is likely to cost an extra NZD 45, excluding bank fees. It's not an insignificant amount and makes a valid reason for switching to MasterCard from Visa if you do spend in foreign currencies frequently. See our Best Bank Currency Conversion guide for more details about the range of bank currency conversion fees. Best of all, such credit cards do exist - we outline our picks in the Best Buys section below. If you make purchases online, travel often or just want to know you are getting the best value for money, one of these cards will give you the best value on every $1 you spend. $1 for every NZ$100 spent can be used for flights and travel at any Flight Centre store. The best value Kiwibank credit cards reward cardholders with the lowest currency conversion charges (compared to all other banks), low annual fees, low interest and generous interest-free periods. Struggle to pay off a credit card? Read this. If you have difficulty paying off your credit card balance every month, the best deal credit card will be one of low interest - the best foreign exchange rates and conversion commission percentages won't mean much if you're paying 20% rather than 10% per year in interest. Read our low interest credit cards guide for more details. Interest rate on purchases (if not repaid): 16.90% p.a. Interest rate on cash advanced: 22.95% p.a. Interest rate on purchases (if not repaid): 20.95% p.a. 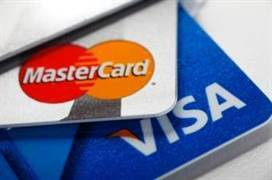 Are there any other differences between MasterCard and Visa? For New Zealand-based transactions, you won't notice any difference between MasterCard and Visa – your card is issued in New Zealand dollars and as you spend in New Zealand dollars, exchange rates won't affect you. Both MasterCard and Visa are accepted throughout New Zealand and worldwide by millions of retailers. If a retailer accepts MasterCard, in almost all cases it will accept Visa, and vice versa. This is not the same for American Express, which has relatively less coverage in comparison.